Working with schools to provide new interpretation for OutStories Bristol’s Revealing Stories Exhibition – Mshed, Feb 2nd – March 3rd 2013. We started a year ago, collecting material culture, newspaper clippings, oral histories and research that relates to the city’s recent LGBT history. We asked local people, museums and the Bristol Record Office for anything they could provide so that we bring it together as a single collection at Bristol’s newest museum. It was amazing the amount of material culture, scans of documents, and newly created artwork we received and how much research we were able to do. We wanted to ensure that our exhibition was accessible to everyone, not just LGBT people, or their family and friends, but everyone. To help promote this, we worked with the Learning Team at MShed and invited local schools for a sneak preview of some of the exhibition, the students provided us their own interpretation to show their understanding, and to provide another layer of understanding for other students of a similar age, whether LGBT or not. As well as increasing the value of our exhibition greatly by broadcasting new, young interpretation, the work with schools also contributes to the ongoing work that the Bristol Museums’ Learning Team undertakes with local schools. The schools worked with us in two strands – firstly, small groups of students from two schools contributed to the Revealing Stories exhibition with their own interpretation of the objects, and their thoughts and feelings based on their experiences of LGBT issues at school. Secondly, young historians at GCSE and A-Level were invited to reinterpret parts of the permanent MShed displays to reveal ‘hidden’ LGBT stories behind them, tying our exhibition into the rest of the museum, and LGBT history in with the rest of Bristol’s history. Examples of the discussions contributed by the schools for the Revealing Stories exhibition include ‘the history of the word gay’; ‘the colour pink and gender-stereotyping’; personal stories about ‘self acceptance and identity’; how Ian McKellen and Lady Gaga have changed the contemporary school-scape in terms of sexual orientation and acceptance; homophobia in British Football; and commentaries to go alongside Bristol Pride objects included in our exhibition. We’re so pleased and proud that we’ve been able to connect with students on this project. Considering the sometimes brutal history of LGBT people in Bristol, it’s really wonderful to celebrate, and openly discuss contemporary LGBT issues with young people, to receive such positive stories and well-thought out interpretation. 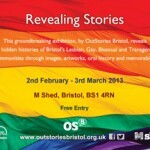 [The ‘Revealing Stories’ exhibition is running at MShed from 2nd February-3rd March 2013 to coincide with LGBT History Month. The MShed is open Tuesday-Friday 10am-5pm.